There is a lot of discussion about Black vs Gray plates tubes. Some people believe that claim that black plates sound better is just a myth created by tube vendors to increase prices, some people swear by black plates in their systems. So what’s true and what’s not. 1) release of gas from anode metal – outgassing, and thus contaminating vacuum. 2) heat up of control grid – causing grid emissions, and thus increasing noise or even causing cathode stripping, which in turn increases grid emissions. So in these cases, black is better. So all in all, black plates can have very real benefits on tube performance and thus are not just a BS. To combat the 3 problems, there are other techniques that are used. For Grid emissions, tube like 645P and 6P14P-ev & er have grid plated with gold with a mixture of platinum, which has very low relative emission. Some tubes used fins on grid rods to help with reduction of grid temperature. For secondary emissions, some power tubes like 7236 & 6080 have carbon plates, zirconium coated plates and graphite plates. This is also not a gimmick but the real thing with real benefit in dynamics and transparency. And to reduce anode temperature woven wire mesh plates have been used. Also, tube shields should be avoided as much as possible, since they increase anode temperature by reflecting heat back into the tube. Also, stay away from chrome transformers that are located close to tubes – they reflect heat back. Black transformers are the way to go. This entry was posted in Guides, Vacuum Tubes by tubemaze. Bookmark the permalink. 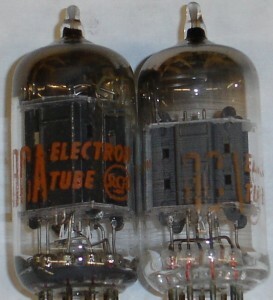 From my experience, black plate tubes usually sound more open and detailed with a huge soundstage. Grey ones usually have deeper bass response with a warmer presentation.